Hence the issue of authenticity and inspiration in a work of art is not a new thing, many discussions have happened in past about this topic, and its a fact that all art works takes inspirations from some existing thing, theme, theory or living/nonliving object. You cant create anything in isolation. but its also a fact that not a single artist who is working seriously can accept that his/her art work is a direct copy of anyone else’s. When the term copy comes, it comes with many layers of references and meanings. Art, here I am talking about the so called higher forms of fine art and the academic trained artists. Our education system in India that is designed by colonial rulers is still working in same manner that is based on copying things not on the understanding. In art schools we learn how to draw, color, carve and create an artwork by copying objects, models, and art works of senior artists. And as much as I know there is not a single art college in India where students get freedom to think and explore their own things without any hierarchical superposition of art works by seniors. There can be many issues related to this single word “copy” with a reference of an artwork. but its not a matter of discussion here, By the way there is an interesting story behind this article. It’s started with a face book comment by a senior art curator on a very young and promising artist’s work. The artist named Ravi Chunchula has made a 3d work by using paper, color and some adhesive material that looks like an original beehive and the work is installed at Niv Art Centre, it is basically a site specific work, and Ravi who have some other works also at different parts of Niv Art Centre has installed it to create that natural feeling of a place in very contrast set – up of a urban gallery space. 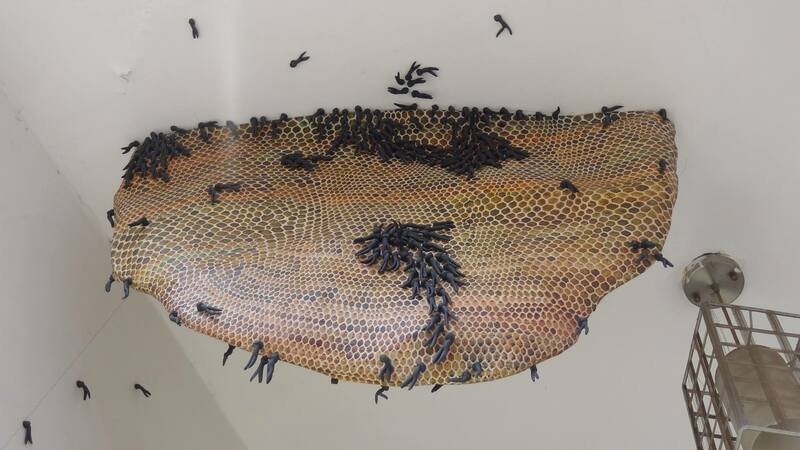 It has nothing to do with Vibha Galhotra’s signature art work called Beehive, which she have done in 2008 and exhibited at LKA and some other places. There are some important points , the first thing is that how can a senior Curator like JML who always talks about the content and concept and placement of the work can make this type of comment, there is nothing similar in these two works, and he knows it better that the time of formal analysis has gone a long time ago. The other and most important thing is that, why we are behaving so aggressively with our young artists.Yes there is a freedom for everyone, and anyone is free to make comments, but was it possible if the same thing happened by a senior artist. Can anyone suggest a single name in the art world whose art is not inspired by any other artist? It’s an endless discussion but the most important thing is that to criticize any one is very easy but we should appreciate and encourage young artists and before that we should at least try to understand the works before start to relate it with anything else.